Succulents can be the most intricate houseplants out there. They are available in a variety of colors, styles, shapes and sizes, perfect to match any houseplant lover’s wants and needs. It is a common misconception that only cacti can flower. But that’s not true! There are succulents with beautiful flowers. We have picked out some amazing and unusual flowering succulents to showcase for your collection. If you are just getting started with succulents, check out our tips for beginners. An important tip to remember is succulents need well-draining, dry soil to thrive. Espoma’s Cactus Mix will help keep your plants healthy and happy. This stunning succulent comes in a variety of vibrant and cheerful colors that will brighten up any home. The blooms on this succulent last almost all year long. Kalanchoes prefer bright indirect light, with only being in direct light about 2 hours a day. Water every two weeks when the top inch has dried out. Trim off the dead flowers where it meets the foliage to keep it looking its best. Also known as the luckiest houseplant, this succulent will bloom tiny white flowers, though it doesn’t happen very often. Jade needs to be in an environment similar to its native growing habits in order to bloom – cool nights, bright days, and lack of water. Don’t give up on this plant so quickly, as it needs to be fully matured before it will flower. Commonly known as Crown of Thorns for the thick base and long thorns, the Euphorbia Milii’s flowers come in small clusters. The blooms are usually a light red, but can be found in vibrant yellows and deep reds as well. 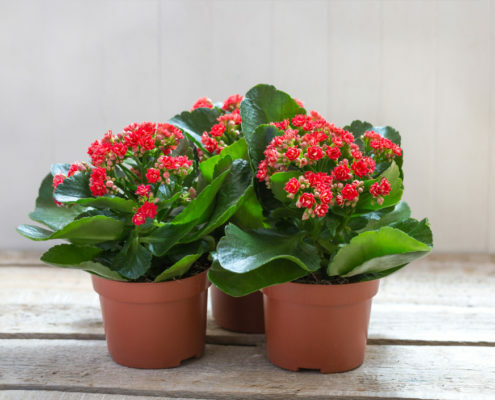 It is a common houseplant, preferring bright light and dry soil. These trailing succulents cascade over their containers. With their grey-green tear-drop shaped leaves, the “donkey tails” can grow up to two feet long. Flowers with small blossoms in red, yellow or white will emerge in late summer. Place these sun-loving succulents near a sunny window and water weekly during spring and summer. Watch as Laura gives a few tips to get you started on succulent care. While getting ready to decorate and hang the flag high for the Fourth of July, think of your garden. Show off your patriotic colors with red, white and blue plants for your garden or containers. Don’t worry though, patriotic colors stay in season all year long. Red hues will make your garden look bigger, white plants are perfect for a moon garden and blue plants bring a peace of mind for relaxation. Red roses are one of the most traditional plants to grow in the garden. They either become the statement plant or are a fine complement to a focal point. You can use roses to cover up an unsightly area or add fragrance. Feed regularly with Rose-tone to ensure bright colors and thriving blooms. With a bright and cheery demeanor, gerbera daisies have quite a bit of flair. They will have single, double or even multiple petals, which can add some texture and contrast to your garden. They will withstand the summer heat with their sturdy stems and big blooms. Feed regularly with Flower-tone to give their stems a boost. Ox-Eye daisies’ will be in full bloom by the Fourth of July. With their white rays and yellow centers, they will be sure to brighten up a patriotic space. They grow 1-3 feet tall so they will not take up too much space. Feed regularly with Bloom! liquid plant food for vibrant whites and beautiful fragrance. 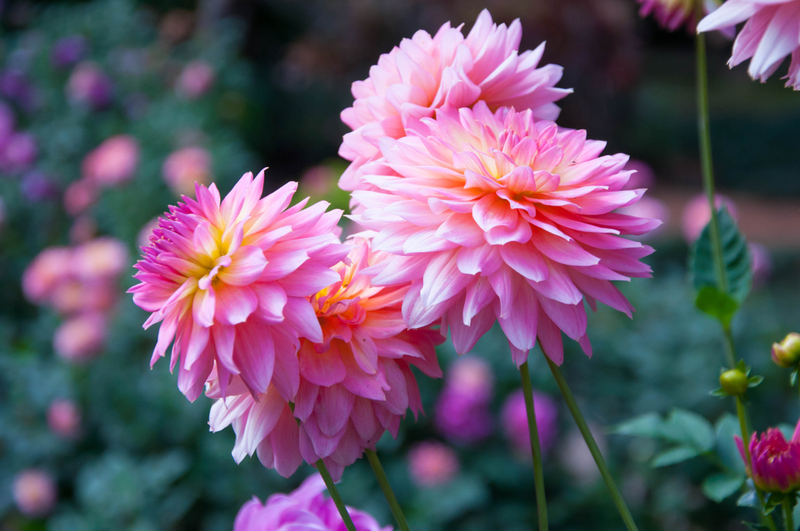 With a variety of sizes and varieties, dahlias can add a lot to a garden. As one of the most popular summer flowers, dahlias live up to their reputation. Whether you choose a ball or a collerette, the dahlia will be the talk of the neighborhood. When planting, feed with Bulb-tone for full, bulbs that will last all summer. Large, beautiful blue hydrangeas are a great addition to your patriotic garden. Their bold blooms make them perfect for freshly cut or dried flowers. Getting off to the right start in the right location is key to keeping your hydrangeas blue. If you are having a little trouble keeping your blooms blue, feed with Holly-tone to keep the soil acidic. A quirky take for your patriotic garden, but perhaps one of the most American fruits, blueberry is another great choice. With their red insides and blue exteriors, they would be perfect with red and white companions. Plus when you are itching for a holiday snack, head right outside and pick one off! Be sure to feed with Holly-tone to give it the nutrients it needs. Beautifully flowering hydrangeas are a telltale sign of summer. The white, blue, pink or purple flowers paired with bright green foliage look gorgeous in every summer garden. With big colorful blooms and beautiful green foliage, summer’s favorite flower makes a bold statement in any garden. Besides their obvious beauty, there are some facts about hydrangeas worth knowing before embarking on your hydrangea garden journey. With many varieties of the hydrangea species, it is important to keep in mind which ones thrive in your zone and garden. For example, if you live in a cool zone, the Smooth Hydrangea (Hydrangea arborescens) is a great choice to add to your garden. Hydrangeas are acid-loving plants. To keep your hydrangeas happy use Espoma’s Organic Holly-Tone to fertilize. You can even adjust the acidity of the soil to change the color of some hydrangeas. Do you prefer blue to pink? It’s easy to enjoy a garden full of blue hydrangeas by simply decreasing (lowering) the pH of the soil. We recommend amending your soil with Espoma’s Soil Acidifier to help turn your hydrangeas blue. Short on space? No problem! 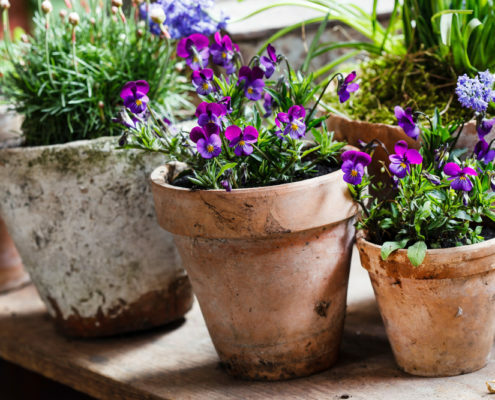 There are several varieties that will thrive in your small space. Our Hydrangea Variety Guide will help find the right dwarf hydrangea to put in your containers. Next, find a spot that matches the amount of light they need. Be sure to use a good quality potting soil such as Espoma’s Organic Potting Mix. Choose a container that is 1/2 or 1/3 bigger than the plant itself. It is important that the plant does not get crowded in its container. The last step is to water well and most importantly, enjoy the big beautiful blooms! Don’t settle for bushes. Grow a tree! While we’re typically used to seeing low growing hydrangea bushes, how great would it be to see hydrangeas on trees? Well, the good news is, you can! Hydrangea paniculata, also known as Grandiflora, produces white conical flowers instead of big spherical blossoms. With some pruning and proper care, it can grow up to 25 feet tall! Grandiflora, known among gardeners as Pee Gee Hydrangea, is your best bet for growing a hydrangea tree. Check your hardiness zone, as hydrangea trees thrive in USDA plant hardiness zones 5 through 8a. Hydrangeas prefer full sun for most of the day and a bit of afternoon shade, so be sure to choose a generally bright spot. One of the most important parts of growing a hydrangea tree is pruning. The main difference between a hydrangea shrub and a tree is training, pruning and proper care. Hydrangeas make great companion plants. Pair them with delicate foliage, bold flowers or subtle ornamental grasses for an extra pop of color in your garden. Pair with shrubs, flowers and grasses for a look that pleases. Begonias and geraniums are beautiful flowers that come in many different shades making them a perfect companions for hydrangeas. Create a colorful rainbow garden by pairing blue hydrangeas with pink geraniums or white hydrangeas with scarlet begonias. Whichever you choose, look for companion plants that bloom around the same time. When we picture hydrangeas — with their larger-than-life blooms and immense foliage — we naturally envision large plants. Believe it or not, hydrangeas come in not one, not two, but three sizes! Dwarf varieties are petite beauties that pack a powerful punch. Scroll through our Hydrangea Variety Guide to find the right dwarf or full-size hydrangea for you. Appreciate your hard work growing your hydrangea garden by putting together hydrangea bouquets to decorate your home, creative art projects, making a hydrangea wreath, or dry them out for year-round arrangements! There is no end to the beauty your hydrangeas will bring to your garden and your home. When you think about an edible garden, berries, tomatoes and salad greens usually come to mind. However, nothing is quite as gourmet or unusual as adding bright blooms and petals to your salads, desserts and meals. Edible flowers picked straight from your organic garden and rinsed before adding to a dish make a colorful and tasty complement to your summer meals. The best tasting part of many flowers is the petals. Remove pistils and stamens or stems before consuming. Note that not all flowers are edible, do your research to properly identify flowers before eating them. You’ll also want to make sure your flowers are grown organically for the healthiest and safest choice. Choose Espoma’s Bloom! 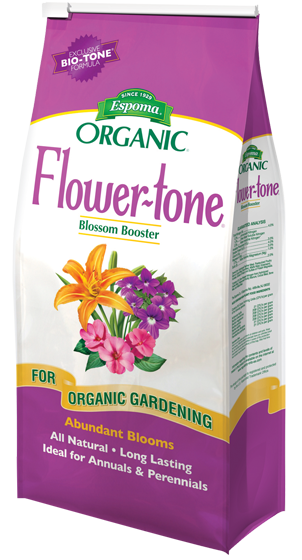 liquid fertilizer or Flower-tone for organic gardens. 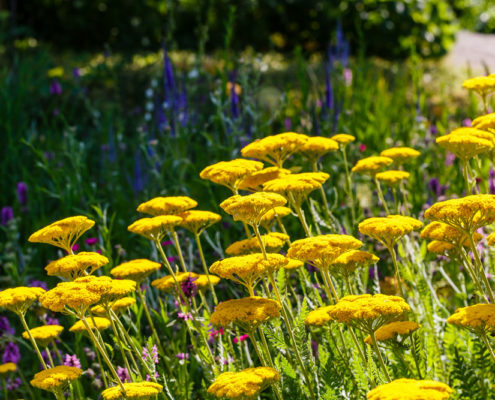 These perennial garden favorites also make for great meal additions. Add to stir-fries salads, dessert or sautés. Harvest blossoms just before they open and stuff as you would squash blossoms. These plants are grown almost anywhere, but thrive in USDA hardiness zones 4-9. Lavender is an all-purpose bloomer. Besides serving as both an edible and ornamental plant in your garden, lavender is also pet-friendly and can help to repel pests. Add flowers to sauces, dressings, baked goods, ice cream and more. Don’t forget to remove the flowers from the stalk. Hardy in zones 5-9. Bright and colorful coneflower is known for its healing properties and is often used as a home remedy for colds. These plants are also known favorites of pollinators. Add petals to salads and dishes for a vibrant splash of color, save the roots and seed heads for tea. Best grown in zones 3-9. Sweet pansies, violas and violets make wonderful additions to lollipops, ice cubes and cakes. Pansies are especially great because the whole flower is edible. Choose varieties best suited to your growing conditions. Best suited for zones 2-10. What’s better than decorating your home with summer bouquets of flowers directly from your garden? Having a cut flower garden is not only convenient for on-demand bouquets, but also for adding color your garden with stunning oranges, yellows, purples, pinks and blues. 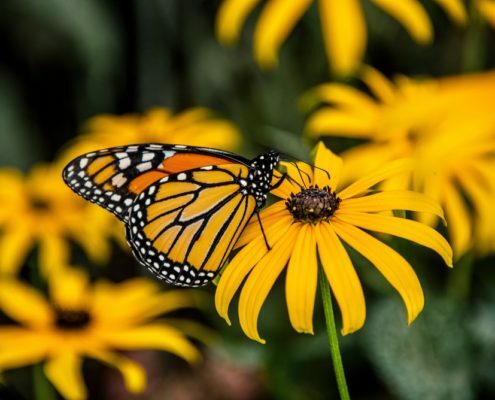 While you often choose plants for bees, these flowers are for the butterflies. Pollinators need love year round and that starts with gardening organically. In honor of National Pollinator Week, here are our best tips for celebrating by building a butterfly bouquet with the flowers they love! 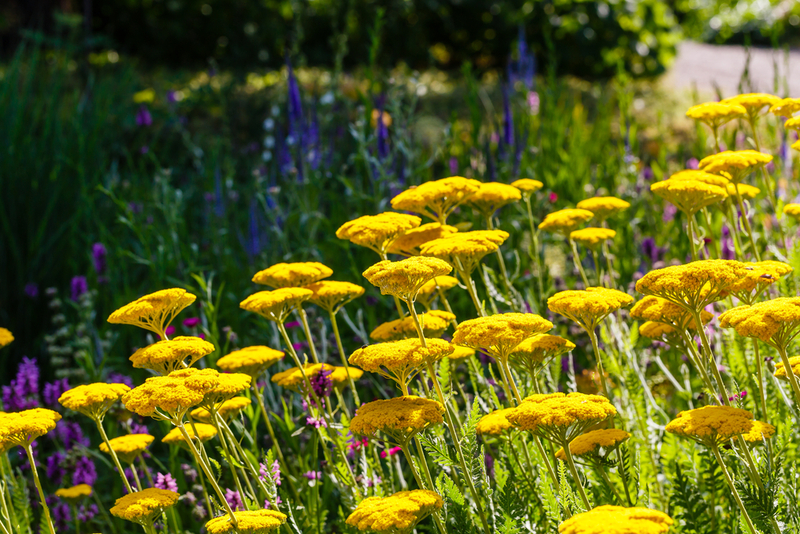 Yarrow is a vibrant yellow perennial. It has a lengthy flowering time from June through September. It is a relatively tall flower with an average growth height of 2.5-3 feet. Butterflies love these flowers because they’re easy to land on and also loaded with sweet nectar. Give your flowers a strong soil base to help them thrive through the hot summer months with Espoma’s Organic Garden Soil. Best suited for zones 3-8. Ox-Eye Daisies are a classic addition to your garden. Their flowering time covers the summer months from May to August. With their white rays and yellow centers, they will be sure to brighten up your cut flower garden. They grow 1-3 feet tall so they will not take up too much space. Butterflies love Ox-Eye Daisies because they are nectar-rich. Best suited for zones 3-8. 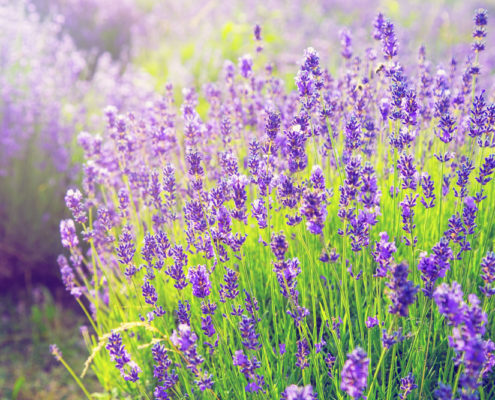 English Lavender is a garden essential! Their flowering period covers the summer months of June to August. They grow to the perfect height of 1.5-2 feet. People and butterflies love English Lavender for its fragrance and remarkable blue-purple color.. Best suited for zones 5-8. The Blanket Flower is a vivid, color-rich butterfly flower to add to your garden. They flower in summer months from May through August. Blanket Flowers tend to be on the shorter side, only growing 6-12 inches tall. Their stunning blood-orange red petals and yellow tips will have your jaw on the floor by the time flowering season rolls around. Butterflies cannot pass up the nectar and vivid colors on these stunning flowers. In order to get the biggest flowers, fertilize with Espoma’s Bloom! liquid plant food. Best suited for zones 3-10. Bee balm is another pollinator favorite that should earn a spot in your pollinator garden. The Bee Balm’s flowering period only covers July through August, but their violet blue, red, pink or white color will be worth it. They thrive in zones 4-8 and are relatively tall, growing an average of 2-3 feet. 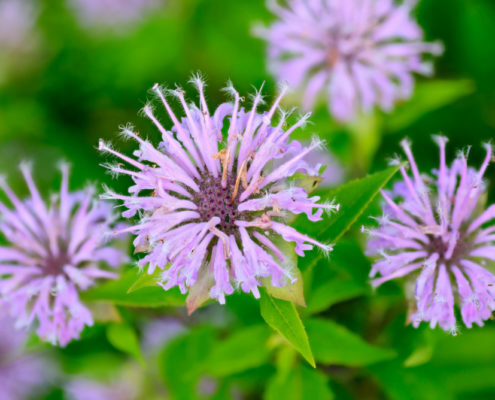 Bee balm is nectar-rich and its bright coloring makes it an easy sell to butterflies. Boost your Bee Balm with Espoma’s Organic Flower-tone fertilizer for big, healthy flowers. Best suited for zones 4-8. The temperature is only getting warmer, which means it’s time to start a cutting garden! From lilies, to dahlias and zinnias, you can have nonstop blooms. Cutting gardens can include anything from roses and shrubs to perennials, annuals and even bulbs. Cuttings from berry bushes can even make a great complement to fall bouquets. The fun doesn’t stop with just pretty vases and bouquets, you can also grow flowers for dried arrangements in the cutting garden. You may be wondering why you would want to spend time in the sun and dirt all day. Trust us! The five reasons below are just a few personal favorites of why growing a cutting garden is worth it. Stop by your local garden center to find out which plants will work best in your yard for your cutting garden. Nothing beats a fresh cut flower arrangement. It’s even better when it’s handpicked from your cutting garden. Enjoy blooms both in your garden and your favorite vase. Feed blooms with Espoma’s Bio-Starter Plus when you plant for extra flower power. Digging, planting and working in the garden all benefits your physical and mental wellbeing. Gardening gets your body moving. Unplug from electronics for a bit and enjoy the fresh air. It will help clear your mind. There’s no reason to never have fresh flowers for bouquets when your cutting garden is in bloom. Those endless bouquets don’t come with a price tag and there’s no need to tip the delivery person. Gardening brings people together. Whether you are trying to get your family involved or are looking for some help, gardeners are open and honest about everything. If you don’t have a place to garden at home, join a community garden and make friends who also like to get their hands dirty. Having a cutting garden will help boost curb appeal. Surround your property with beautiful flowers of all kinds for a look that will make your neighbors green with envy. Proper maintenance and Espoma’s liquid Bloom! will have your house looking picture perfect, and boost your real estate values, too! Think hydrangeas would be perfect for your cutting garden? Laura from Garden Answer shows you how to plant them. While most plants need only need some sunshine throughout the day, others love being in the sun all day. Sun loving plants can fill spots where you need some life or color in the garden. Know where the sun hits the most in your garden before picking plants out and then head over to your local garden center for the best choices. As the name states, this flower was made for the sun. It screams summer the way no other flower can. Since they are native to the United States, they will grow well and easy pretty much anywhere there is sun while bringing along pollinators to help. Your climate will determine how big and tall your flowers get. Named for their dark brown centers peeking out of the gold or bronze petals, black-eyed susan’s thrive in the sun. These daisy-like blooms are perfect for the long summer days. They tend to grow to about 2 feet tall and handle high heat and drought conditions well. Hardy in zones 3-9. This perennial is drought tolerant, and has a long flowering period through summer into fall. They can sprawl throughout the garden, which makes this a fun groundcover. It comes in a large variety of colors. It is a powerhouse in the garden and is easy to grow. Hardy in zones 3-9. Another fan favorite, peonies make the most amazing cut flowers. When growing them in a cutting garden, be sure to get them into full sun. With so much texture, color and fragrance, there is no shortage of reasons no to include them in your garden this year. Hardy in zones 3-8. Fountain grass is a perfect ground cover anytime you want to add texture to your garden. Planting a dwarf variety will help you add texture in smaller areas. This pant does well in both dry and wet areas, so as long as you give it sun, it will do well. Hardy in zones 5-9. This is a plant that will keep on giving. Every year, sedums tend to grow bigger, so it is a perfect plant for a border or an area that needs filling. Depending on the variety it will either hug the ground or grow up to 3 feet tall. Hardy in zones 3-10. Since these plants will be hanging out in the sun all day, be sure to keep them watered and give them a boost they deserve with Espoma Organic’s Bloom! liquid fertilizer. After planting, mix it with water and give them a good drink! See the back of the bottle for directions. Once you’re done in the garden, try making a hanging basket for your porch. Every year gardeners want to expand their gardens to offer new colors and plants to make it fresh. This year, Ultra Violet is the color on trend, so we looked for the best purple plants to include. We created this list of a variety of flowers, foliage and pollinators to fit any need. Plus they all smell divine. 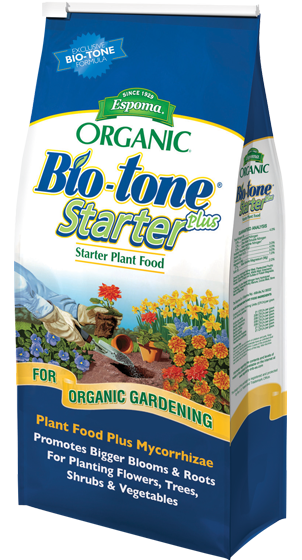 When planning to plant, start your new plants off right with Espoma’s Organic Bio-Tone Starter Plus plant food plus mycorrhizae. Not only is lavender a beautiful purple shade, but it has a strong fragrance that helps to alleviate stress. Lavender, with its attractive foliage, purple flowers and scent is the symbol of summer which is a must for every garden. Bloom time is from June to August. Clusters of little purple flowers top the stems of this beautiful plant. Verbena is drought tolerant, so it fits into any climate. Bunched together this plant can pack a punch of color. Bloom time is from summer through fall. This plant shines purple through and through. This salvia plant is popular for the long spikes of purple flowers that bloom in the summer and fall. It is a pollinator plant, attracting everything from bees to hummingbirds. Perfect for containers near your entryways, Heliotrope is known for its vanilla fragrant flowers. It is a wonderful treat for summer, especially when paired with lemongrass and lavender. These purple flowers are small and dense, but should not be overlooked. Bloom time is summer through fall. While the most popular varieties of bee balm is red, there are some beautiful selections that bring purple flowers. They are easy to grow and will bloom from summer through fall. It is a great pollinator plant, loved by hummingbirds and bees. For even more options, head to your local garden center to see what plants work well for your area. Once your new plants are established, feed regularly with Espoma’s Organic Grow! liquid fertilizer. It gives them the boost they need to have bright colors and vibrant blooms. Rose gardens are one of the most classic pieces you can add to your landscape. With some love and regular upkeep, they can last for years. Roses bring beauty by either becoming the statement plant or a fine complement to focal point. You can use roses to cover up an unsightly area or introduce a new fragrance, they are incredibly diverse. Roses are offered in a large variety of colors and patterns to match anyone’s need. When choosing the best rose for you garden, be sure to know how much sun the area gets. Check the tags on the rose plants to ensure you are picking up ones that will thrive in yard. If you aren’t sure what to choose, your local garden center can help choose for your space and your region! Plant Time. Wait until after the last frost to get your roses in the ground. Most roses want to establish roots in the spring before the weather gets too hot. Space is Key. When planting, dig a hole deep and wide enough to accommodate the roots. If you are planting more than one bush, keep at least 3 feet in between each plant. Add Bio-tone Starter Plus to promote bigger blooms. Feed Often. Give roses Espoma’s Organic Rose Tone to help keep roses vibrant and looking their best. Feed regularly as described. Watering Deep. Roses don’t do well in drought conditions as they need a good deep drink often. At least once per week water about an inch deep and evenly around the plant. It does better as the soil is even throughout. Try to get the water around the roots and not the leaves. As your roses start to bloom, be sure to keep up with the maintenance. If the blooms are looking dead, remove the spent flowers. This will give the bush extra energy to produce bigger and fuller blooms. Roses will continue to flower throughout summer, so don’t be afraid to deadhead into August. Watch as Laura from Garden Answer plants her own roses! Right about now, daffodils and tulips are in full bloom making even the simplest of streets beautiful. People are snatching up the blooms and putting them in vases and arrangements. And some are even heading into garden centers to get those flowers for their garden. But, in most regions, spring blooming bulbs are best planted in fall to be able to bloom in the spring. Don’t worry! There are many varieties of spring-planted bulbs that are just as beautiful as your traditional favorites. Keep your garden thriving and plant bulbs now to have amazing summer color. Wait until the last frost date has passed to plant to ensure your bulbs won’t freeze. Check the tags on your bulbs for planting information or head over to your local garden center for specific region information. Don’t forget to mix your soil with Bulb-Tone to create beautiful big blooms! With a variety of sizes, colors and designs, dahlias have become one of the most popular flowers. Be sure to buy a bunch of bulbs though, it’s hard to plant just one. Bloom time is between mid-July and September. These dazzling beauties will showcase your garden anywhere you plant them. They are technically a tuber, but are planted the same way you would plant a bulb. Stay on trend this year and plant a lily. With the option of Asiatic, Trumpet or Oriental, or a mixture of the three, your garden will be full of color lasting summer through fall. Look for lilies with the color and pattern to add texture and design. Bloom time is between June and September, depending on variety. Known as a grandmother’s flower, begonia’s are perfect for any garden. Most people don’t know that the begonia family is quite large, with lots of colors, shapes and sizes. Bloom time starts in mid-July. Since there are so many options with begonias, choose something in the double flower, ruffled double flower or the pendulous varieties. This eye-catching flower will add wonder to your garden. Calla lilies are elegant and timeless and perfect for containers. They come in a large variety of colors and textures to match every style. Bloom time is between July and October. Grab varieties of calla lilies such as Flame, Captain Marrero or Ruby Sensation for the paintbrush affect. This exquisite flower is a display itself with its layer upon layer of silky petals. It is similar to a rose and is often considered high end delicacy. One thing to remember is to soak the bulb before planting to encourage growth. Bloom time is between June and August. Watch below as Laura from Garden Answer shows how to plant bulbs!